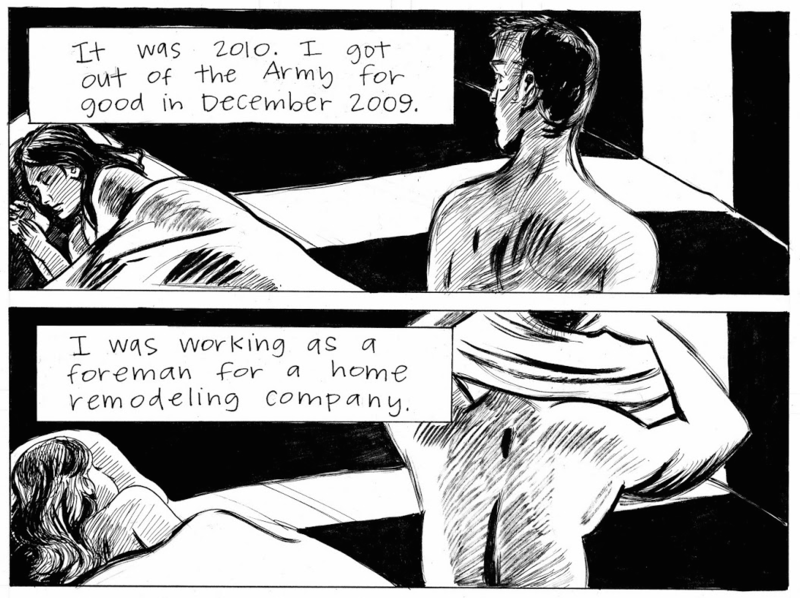 In late 2013, artist and writer Jess Ruliffson finalized work from an ongoing comics journalism project called Invisible Wounds, which is based on intimate discussions with veterans of the wars in Iraq and Afghanistan. Ruliffson’s subjects recount internal struggles they’ve faced since leaving the military. She published an affecting assortment of profiles as a single comic online back then, but her black and white visual narrative is now in print. Via Brooklyn, New York indie publisher So What? 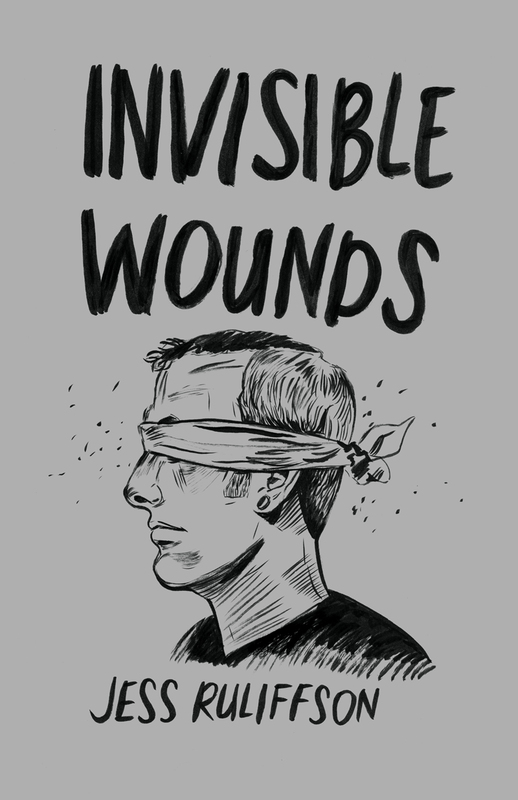 Press, Invisible Wounds was made available at this year’s MoCCA Arts Fest in early April, where the artist was among the winners of the event’s first “Awards of Excellence” for her work. Arms crossed, Ruliffson’s subject at the start of Invisible Wounds seems absent in a horizontal panel on the first page. He dozes while a loudly whistling tea kettle warms in the background. Per a distinctively sequenced pair of pages that appears later in the comic, each breaking significantly from the more linear structure of the illustrations that precede them, it’s as if the vet’s “brain had effectively shut off” when the water boiled on his stove. On one page, a checkering of micro-sized boxes is interspersed with pull quotes from Ruliffson’s soldier that describe his drastic mood shifts, another is framed in kitchen floor tiles with “lost time” represented by advancing clock hands and short, thick motion lines. 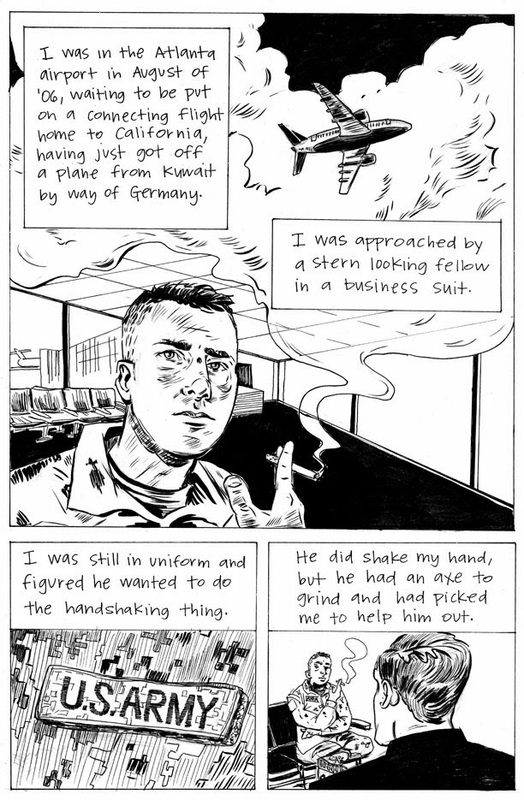 Earlier, the artist melds swirling cigarette smoke into the background during a conversation at an airport terminal, so that the haze just above her soldier’s close-cropped hair meets the clouds around the flight being described in his story. Smart flourishes like these can probably be attributed to Ruliffson’s appreciation for the risks that David Mazzucchelli took in his work on the revered City of Glass graphic adaptation — she mentioned it as a favorite in an interview with The Beat last year. Jess Ruliffson will be at the marvelous Desert Island in Brooklyn on Thursday, April 17th.